Enjoy some of the finest views in Wales from our converted Edwardian railway carriage. 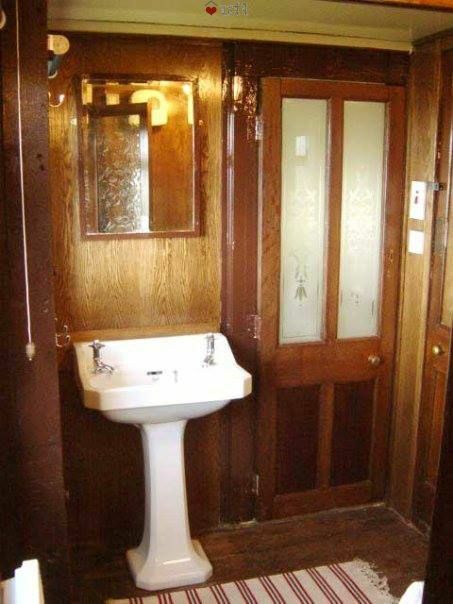 History - Our carriage is the sole surviving carriage of her type. The Vintage Carriages Trust rates her as 'very important' historically. 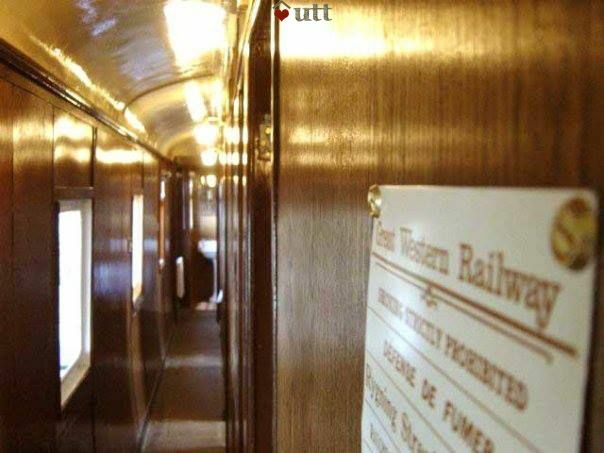 She was built in 1905 as a LSWR (London & South Western Railway) Sleeping Car for the Plymouth-Waterloo 'boat train', with seven single and two double compartments, a lavatory and a compartment for the attendant. The train was timed to line up with passenger sailings from Plymouth. She was sold to GWR (Great Western Railway) in 1911 and converted to 8 single, and 1 double in 1919. In December 1931 she was retired from use, and in 1936 she was purchased from GWR Swindon and delivered by rail to (then) Newcastle Emlyn railway station. 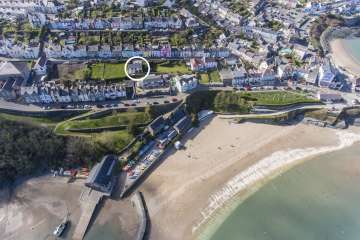 She was then delivered by lorry and bogey to Aberporth where she has rested ever since. 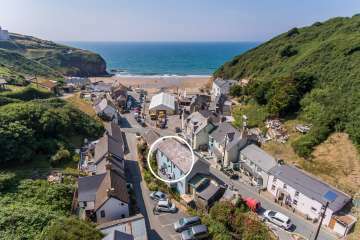 Her original neighbours at Aberporth were carriages from Queen Victoria's own train... but one has since been removed to a museum, though other historic carriages can still be seen on the coastal footpath. We keep her painted in GWR colours. There have been many changes but original detail remains including the side corridor past the bedrooms. All rooms in the carriage are lined in oak, are insulated and have panel heaters so are suitable for use all year round. We love it when it is stormy in winter! 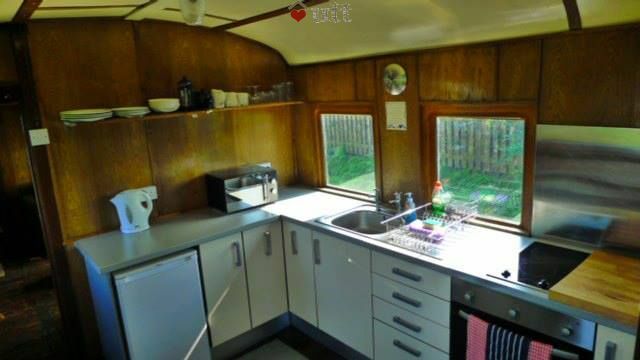 Kitchen with cooker, microwave etc. Fairly basic as kitchens go but better views than most you'll have used! Fridge with small freezer compartment. Door to rear patio. Bedroom Compartment 1: Double bed, cotton bed linen, wardrobe etc, luggage racks! It is compact but cosy. Fitted wardrobe and dressing table. 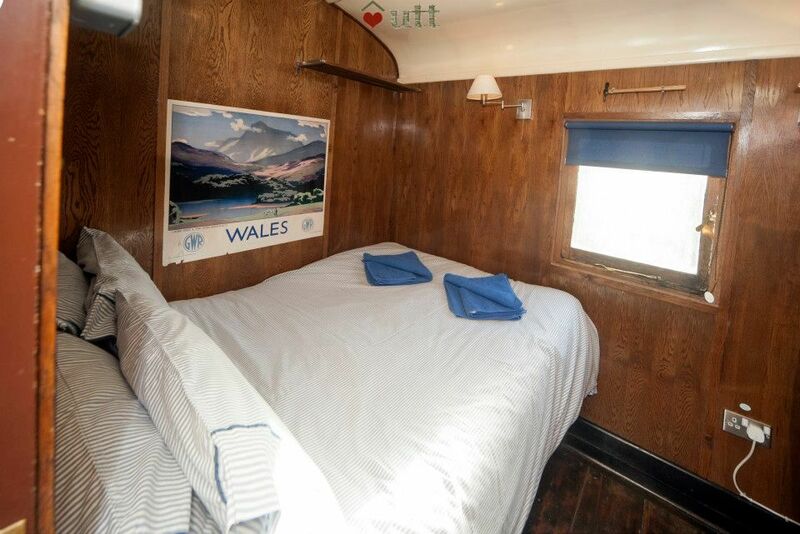 Bedroom Compartment 2: Double bed + one narrow train bunk (suitable only for a child). Again, note it's compact! 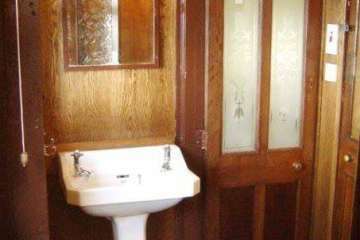 Shower Room with quality quadrant shower, toilet etc. Heated chrome towel rail and blast fan for warmth when you get out of the shower. 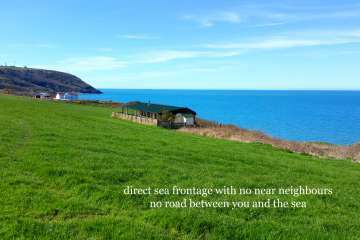 Ceredigion Coastal Path - outside the front door! Harbour Master - Aberaeron (Approx 25 mins drive) on the harbour-side - great food, seafood, views etc. Amazing! What a lovely place to escape to. I have been looking to book Wendy for just over a year I'm sorry I hadn't done it sooner. She is a lovely cosy and different place to stay. The views and walks are just fab. The evenings in in front if the warm fire were great. I came with my 14 year old son, it was lovely to spend some quality time with him away from our busy lives and the PlayStation! He even admitted he didn't miss it!! We played board games, cards, football and climbed a few rocks. People are really friendly and the gentleman in the local shop was really helpful. We walked to Tresaith many times not very far but not for the faint hearted, I think the coastal path has helped me overcome my fear of heights. The food in both Ship Inn was delicious. I'm sorry I did not book for longer, but we will be back. Great place! Full of character and amazing views. Stunning location and so peaceful. There was everything we needed and the Welsh Cakes were a lovely touch and were delicious. 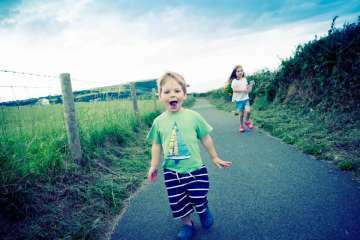 Lots of things to see and do in the area-the walk to Tresaith and back along the coast path with a drink at the Ship Inn was a nices easy morning out. We'd love to come back. Enjoyed a cosy few days in 'Wendy', and loved her quirkiness! Thanks for the fire ready to light and the Welsh cakes. Coast path walk with lunch in Tresaith and a day out in Cardigan made for a lovely little January break, and we were lucky with some beautiful clear nights for a bit of stargazing. Diolch yn fawr. 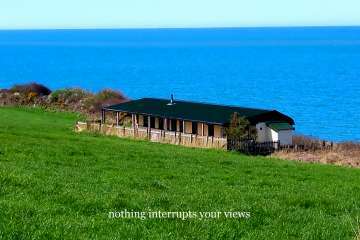 Superb accommodation with stunning views over Cardigan Bay. Coastal path just outside front door. Night sky spectacular. What a superb, cosy, romantic retreat. 'Wendy' is well worn as befits her age (1905), but this is an integral part of her charm. 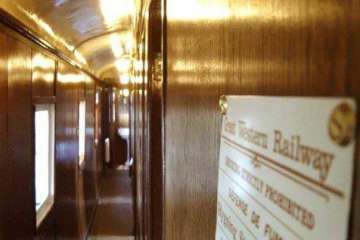 The refits have been kept to a minimum so you get the authentic wood panelled, narrow corridor and cosy bedroom compartments of the original sleeper carriage. The open plan twin sofas, wood burner, sitting room and dining area is so cosy and the kitchen very well appointed. The shower was suprisingly good too. Small touches that completely won us over - the trolley, (very helpful with unloading), the fire had been laid ready for our arrival, mince pies to greet us, no TV (excellent! ), reading all the comments and stories previous tennents had made. 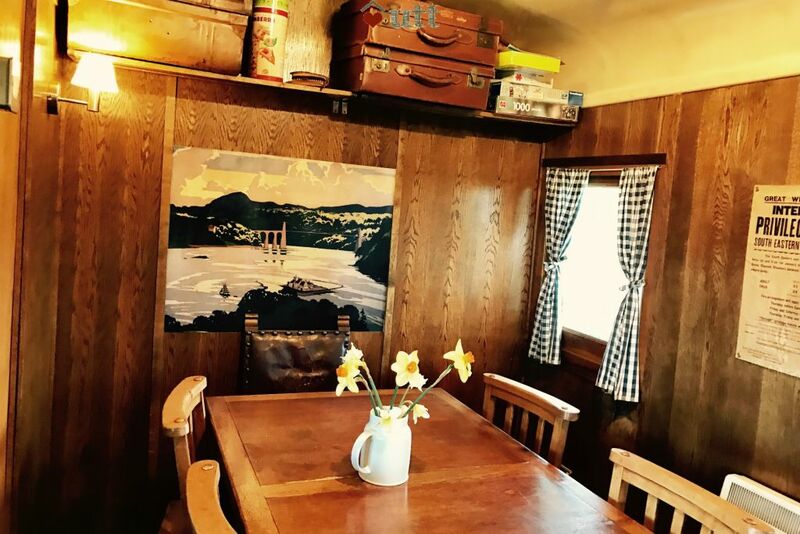 I would highly recommend a stay if vintage railway nostagia is your thing or if you are seking a unique getaway. 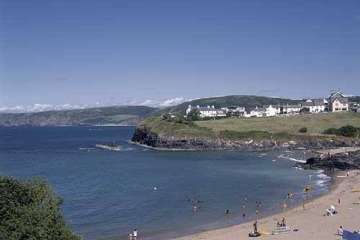 We travelled down from the North To reach our destination, Aberporth. Boarded 'Wendy' 11 minutes late, a railway tradition we must state. Though 'Wendy needs a little TLC, A comfy place she was to be. The sea, several shades of blue ensured we had a superb view. Dolphins spotted in the Bay gave us a thrill and made our day. 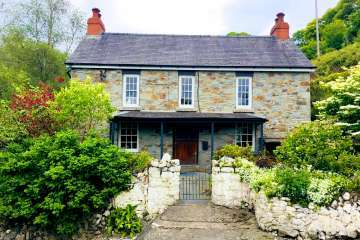 Cardigan, St. Dogmaels, St. Davids and Nevern gave us a taste of historic Welsh heaven. Friendless churches at Bayvil, Tremaen and Llanderloy really were rather a joy. Internal Fire and the Wool museum too made sure there is lots to do. Don't judge the Morelan from the street It serves a pint that's hard to beat. So all in all we have to say We really did enjoy our stay. 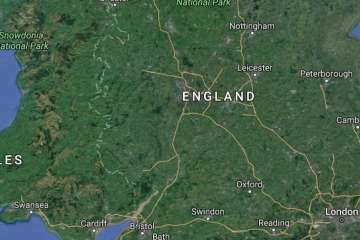 The homeward journey must now start, at 10.00 hours, on time, depart. We spent some wonderful, sunny days at "Wendy", The Coastal Carriage. 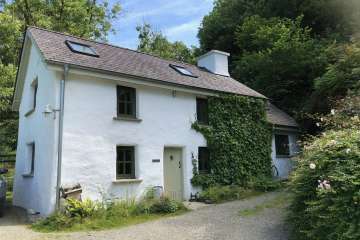 It provided a snug little home for the two of us and a solid base to start explorative walks along the coastal footpath or to one of the innumerous beautiful, historical, interesting places in Wales. Everything we needed was there plus an appreciable amount of love for details. Wendy is well worth a stay! 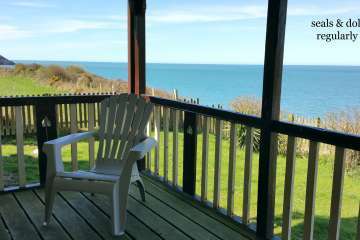 Excellent!No TV,no phone,switchable-off wifi,no traffic,just the sea and the birds and the wildflowers.Right on the coast path totally unecessary to use a vehicle during the stay with enough to see and do on foot.Perfect bolt hole to escape the wedding!We'd love to stay again. We really enjoyed our stay at the Coastal Carriage. 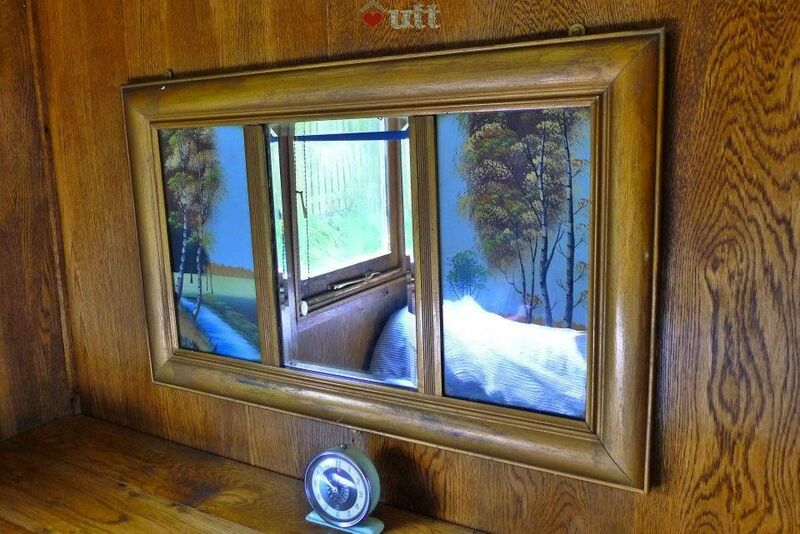 What a cosy, quirky little gem! Our pet dog loved playing fetch and frisbee on the local beaches and we enjoyed some wonderful walks and lunches. Cardigan is a real favourite of ours so the carriage is perfectly situated for trips in that direction. Thank you and I'm sure we'll be back. 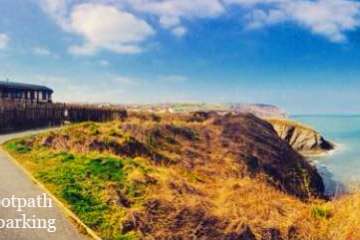 The Coastal Carriage is in an incredible position on the Ceredigion coastal path. On a sunny day, it is difficult to move from the rocking recliner on the verandah as the view is so stunning. 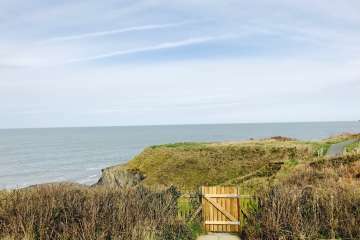 Excellent walks straight from the door to Aberporth, Tresaith ( muddy!) 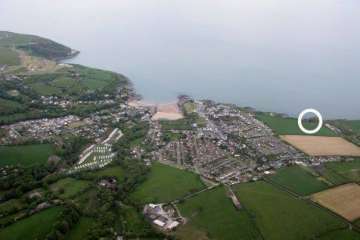 and Penbryn (steep in parts!). Lots of dogs on the paved path, so if you are not dog compatible, this won't be a relaxing location for you. Fantastic birdlife, including a peregrine falcon, but no dolphins or seals for us. Really funky place to stay, but as with most holiday accommodation,the carriage is in need of a little maintenance. 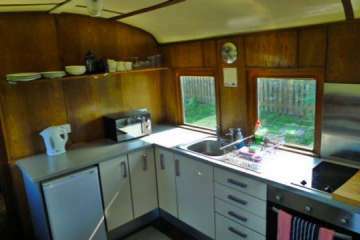 All of the basics are fine - hot shower, good kitchen, great log burner, comfortable beds, .......no TV. It would have been useful to know before we arrived that we could have brought our own data SIM for the WiFi - the closest place to buy one was Cardigan. Similarly, it would have been useful to know that there is a trolley available at the carriage to transport non-wheeled luggage. We will definitely be back. An enjoyable weekend in a unique and well positioned dwelling. 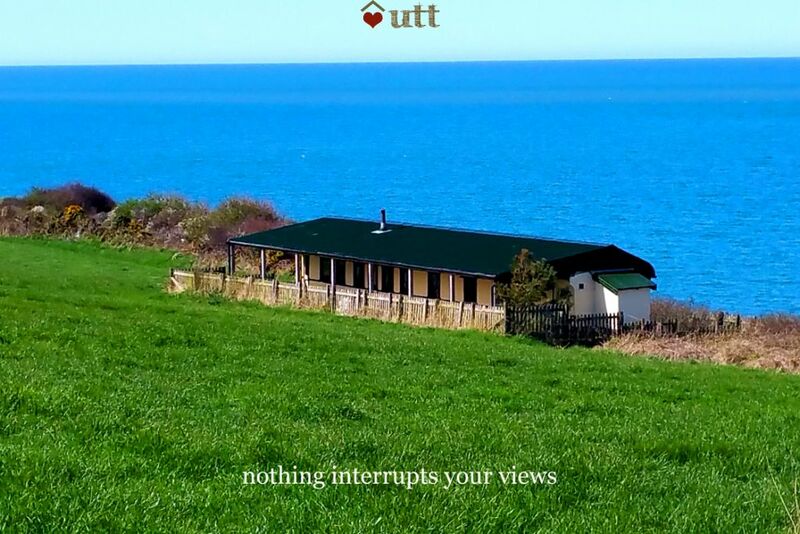 Absolutely stunning, breathtaking views, cosy warm bedrooms, perfect tranquil surroundings. No WiFi during our stay as limit had been exceeded by previous guests, but you don’t need internet here, too many beautiful walks & sights. 5 min walk to car park, a few more minutes and your on the gorgeous Aberporth beach. Kids & dog loved it! Can’t wait to come again! Had had my eye on Wendy for some years and decided to book as treat for birthday/mothers day weekend. Arrived a little later than planned due to traffic and made our way along dark coastal path to the carriage. Easy to follow instructions though and carriage was well lit, warm and cosy. Did not disappoint at all - beautifully done and quiet, peaceful with the most amazing view, starry skies and even a dolphin siting as we had breakfast on the terrace, Really stunning place to stay - and thoroughly enjoyed by the whole family. A memorable experience - diolch yn fawr!! Had a great stay during February half term. The carriage was very warm and cosy even when the wind was absolute freezing outside. Fantastic setting, cosy and very comfortable. We experienced snow and stormy weather but with the log burner roaring it was amazing! We had a fantastic 5-night break in this charming Edwardian railway carriage. This place really is a Tardis; I've stayed in proper cottages that had less space. Everything is well thought out to incorporate a great deal of comfort as well as style. The wood-burner not only looked good but worked very efficiently. Bedrooms were small but not claustrophically so. 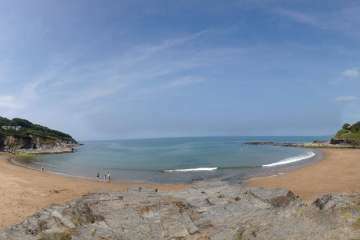 Views were splendid, dolphins were seen a couple of times, passing walkers were friendly, and life was good! We particularly enjoyed swaying from side to side as we walked along the corridor, making train noises! If you get a chance to stay here, go for it. 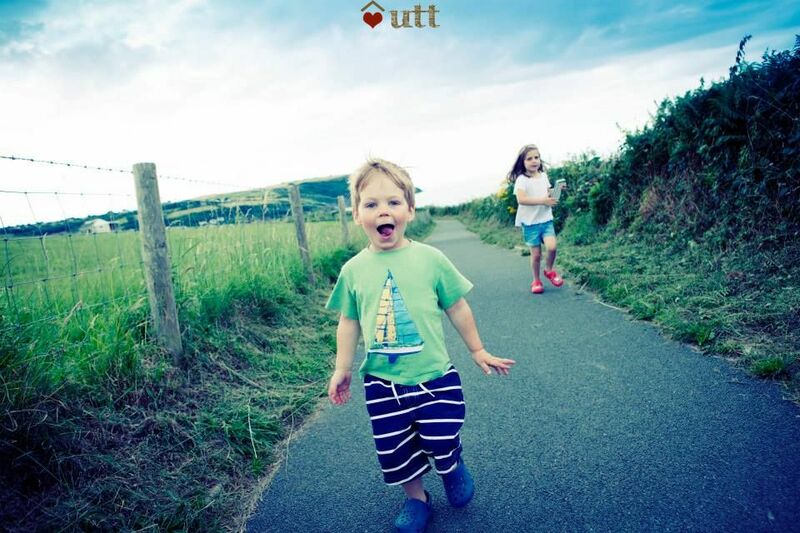 The most perfect spot right on the coastal path and the most quirky, cosy accommodation imaginable. A good shower, a comfy bed, a wood burner capable of belting out masses of heat. What else could you want? Any time of year, and in any weather staying here is simply bliss. My second stay, and looking forward to returning in the spring. 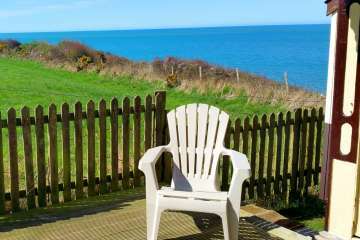 Lovely relaxing holiday, great for dogs with secure fenced garden. Wendy is full of character and cosy. Beautiful location and saw dolphins most days. It didn't spoil our holiday but 2 x balustrade loose, so need fixing if someone goes with kids. Have recommended already!! 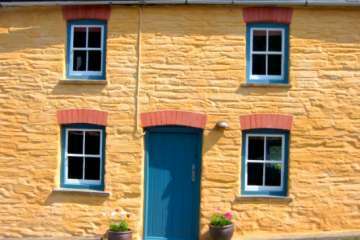 Very original accommodation in a fabulous location, peaceful and beautiful. Thoroughly enjoyed our stay and would definitely return. Wendy has everything you need for a comfortable stay. Quirky place to stay with an amazing view. I have wanted to have a holiday here for ages and wasn't disappointed. Fantastic sheltered veranda outside and very cosy inside when the wind and rain arrive, as they did. 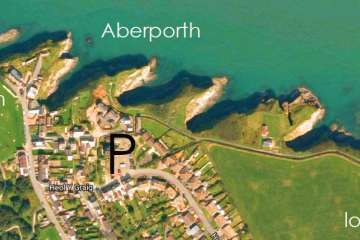 Aberporth beach is a 5 minute stroll along the coastal oath and great for dogs. Loved it!!! 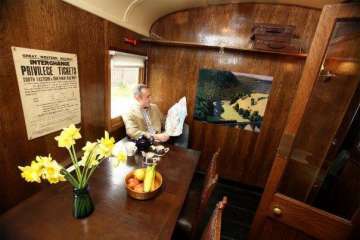 Had a great time for the two days we stayed in the railway carriage. It was lovely and warm inside as it was very cold outside. 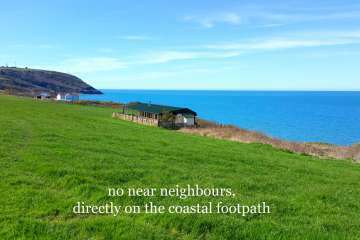 The local people and businesses were extremely friendly and welcoming and we had some exhilarating walks along the coast path. The only problems were difficulty opening the key safe and the door lock, both overcome with a little ingenuity. 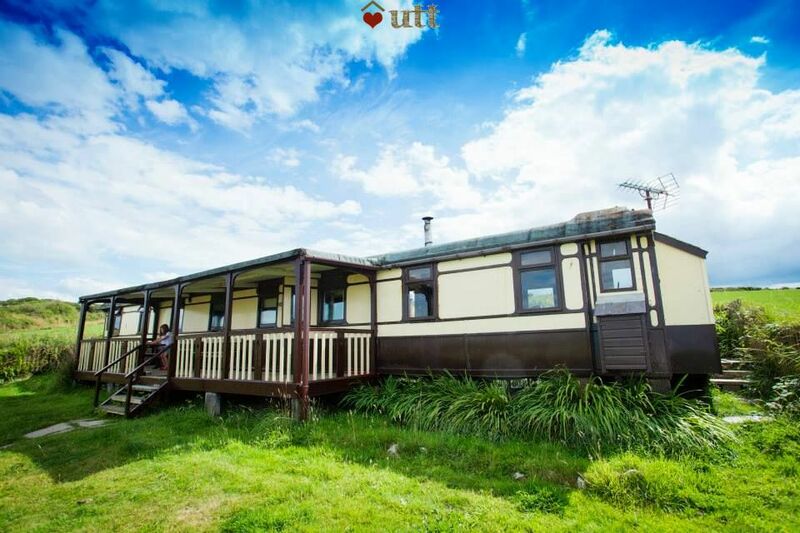 A magnificent quirky and cosy property with fabulous views. The lay out is great for a couple or family. A lovely stroll to good beaches. Wendy is very welcoming and perfect for a hideaway and a place to unwind. Great care has been taken and the attention to detail is perfect. Our third stay at Wendy, we had previously vowed to come back for Christmas as on a previous stay, we arrived just after Christmas and left just before new year. We are certinaly glad we did come back for Christmas Day as our stay can only be described as spectacular! This beautiful carriage has been further improved with the removal of the TV, making our stay even more authentic! We all thoroughly enjoyed ourselves and will definately be coming back again some day! Lovely break staying in Wendy. 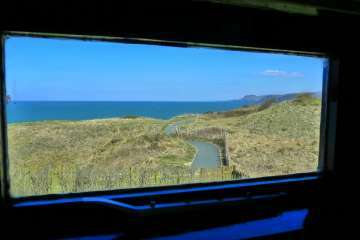 Keep looking out of the carriage windows to take in the view, the sound of the sea and starry canopy at night this was all we needed to feel very lucky indeed. 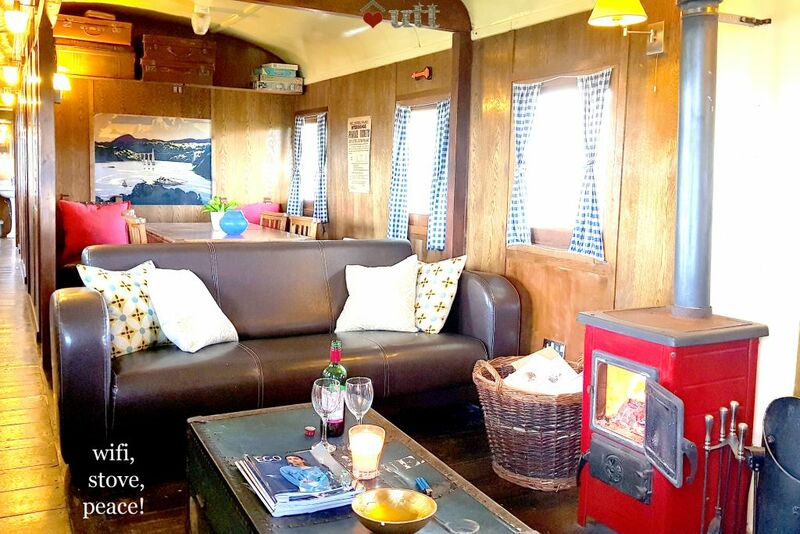 We had the most fantastic stay in Wendy the railway carriage - sooo cute! We loved waking up to the sound of the sea, calling 'tickets please!' and using the station trolley to collect our luggage! 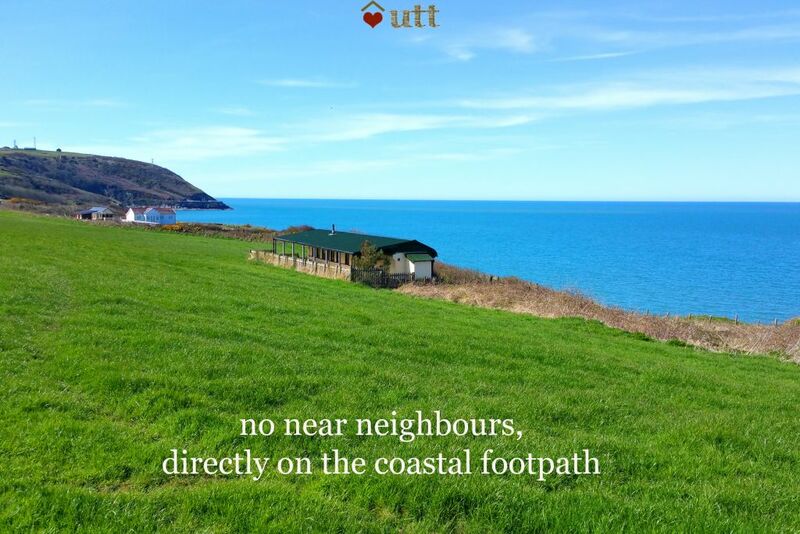 Such a lovely property and a wonderful location right on the coastal path. All arrangements worked like clockwork and the fire was not only warm and cosy but a great companion and source of entertainment. Wow, Wendy did not disappoint! The carriage is a wonderful place to stay, surprisingly roomy and big enough for my partner, a toddler, two fairly big dogs and me and so charming. It is situated in the most perfect spot and we were lucky enough to have beautiful weather. 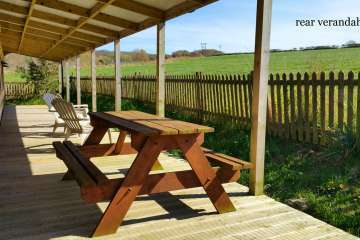 The garden is fully enclosed and dog proof and the back verandah gets full sun and is sheltered so a fine place to sit in the spring sunshine. The views in front are fantastic. Lovely to have Aberporth and Tresaith beaches within short walking distance. We had the best time and my son loved the fact we were living on a big train! We will definitely be back. Loved getting reacquainted with this lovely old girl. Happily the weather was dry and we were able to do lots of walking, returning to our cosy carriage in the late afternoons to get warm by the log burner. 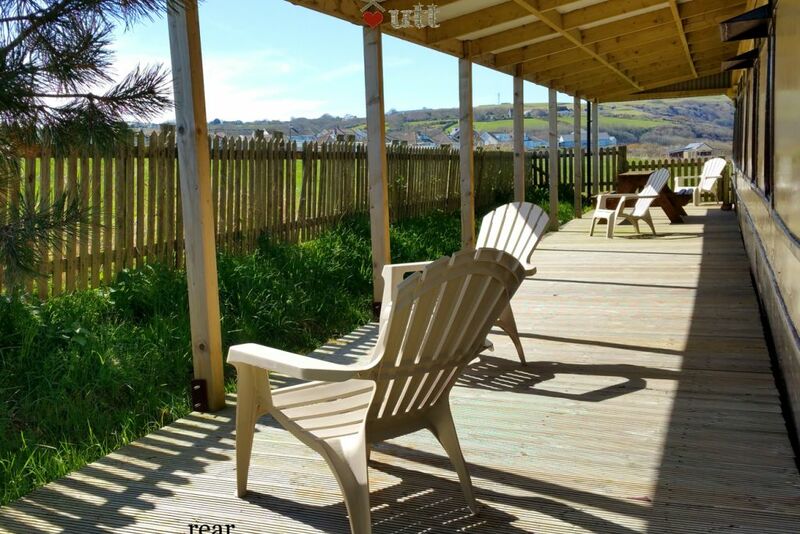 It's wonderful being so close to the sea and the new veranda looking out over fields at the back is an added bonus. No Dolphins this time - doubtless they were in warmer waters! We had a lovely stay in Wendy. 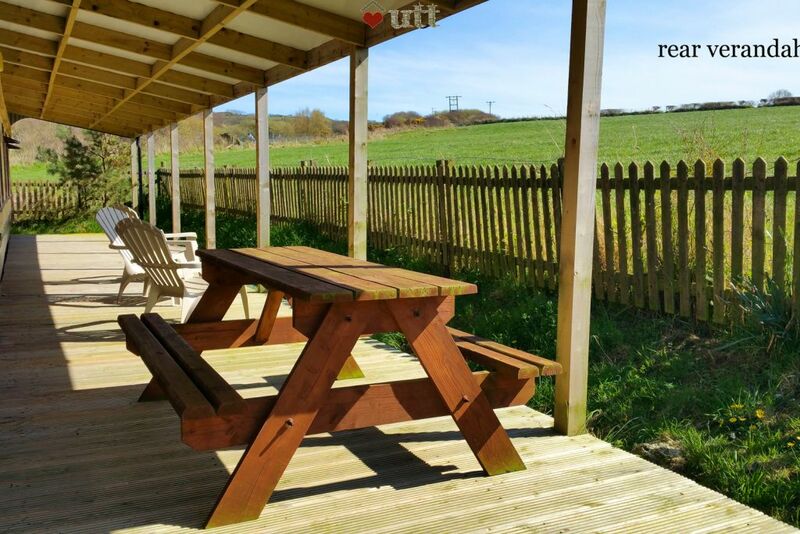 The location and views are amazing and the accommodation is very cosy and comfortable. We will definitely be back. What a fantastic and unique holiday experience . It had everything there that u needed . The views were stunning and really enjoyed our stay . Never stayed anywhere like this before but will definitely be looking again for this or a similar break away with yourselves thank you utt !!!!! What can we say except that we took our vintage clothes. And spent a very vintage 30/40s week in Wendy. Amazing place with a real bygone era feel and although it feels a bit of a trek from the car park with a weeks supply of holiday stuff (a larger trolley or wheelbarrow would be better), it was worth it. 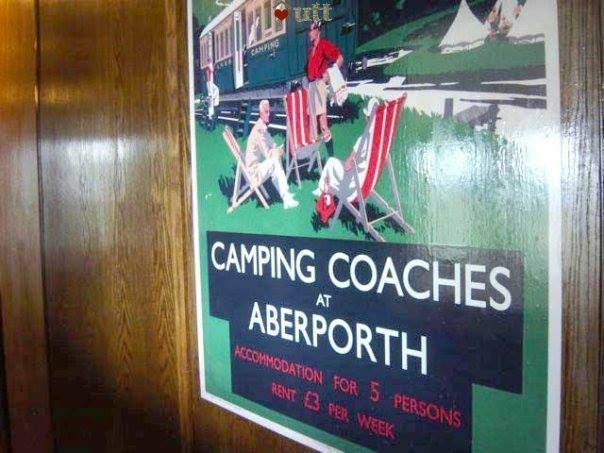 We would return sometime when pennies permit! Thankyou for the opportunity to stay at Wendy for a what was an absolutely lovely week. We had such a great time and were blessed with lovely weather aswell. Can't recommend the place enough. Quite simply it's brilliant in every way! We have just spent a delightful 4 days at Wendy. We had the good fortune to have perfect weather, and spent some of our time - when not out and about- sat on the verandah at the back of the property in absolute peace and privacy enjoying the sun. 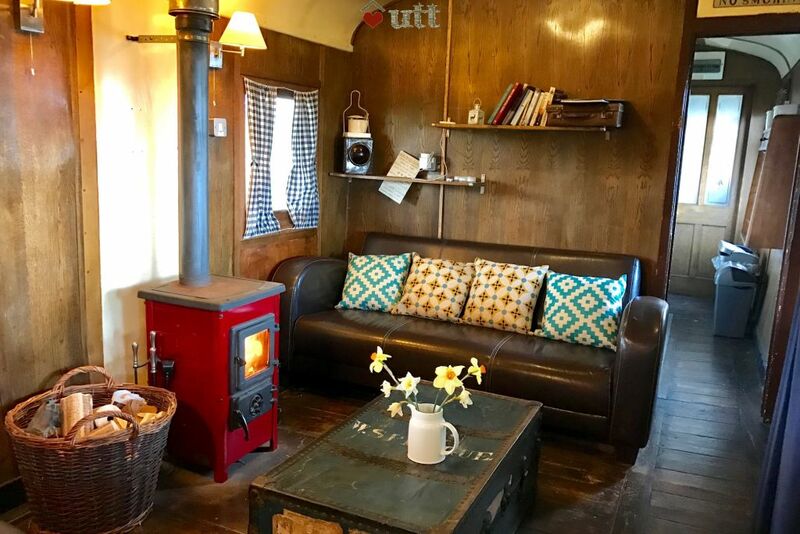 The carriage is very comfortable, with heating for the cooler months and has every home comfort - apart from a TV, worth noting if this is important to you. Having said that, we had plenty to fill our time, from eating out locally, seal watching(I saw one!) to just people watching. Hope to be back. 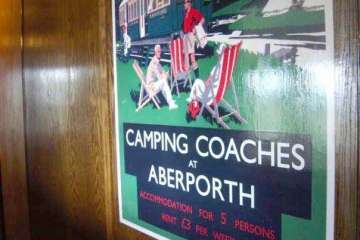 Wendy, the Aberporth Express train, was everything we hoped for and more! We knew it would be fun and scenic, but we hadn't expected it to be quite as magical as it was. 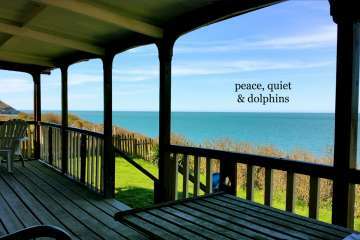 We were blessed with two separate dolphin sightings, a seal who appeared in the sea one evening and even a friendly bat who loved to circle Wendy at night. 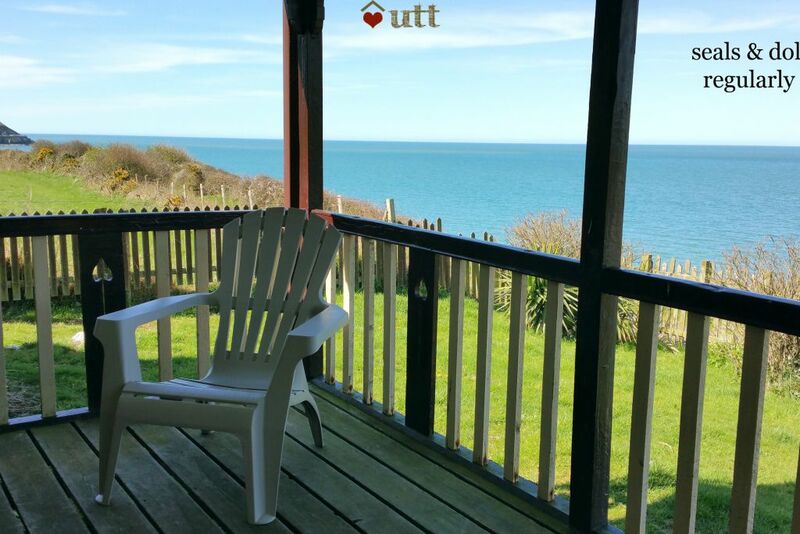 For us, being able to put our daughter to bed in a snug, safe and cosy room and then sitting outside and looking out to sea while she slept was much appreciated. Breakfasts on the veranda were also very special. Our advice is to pack everything in boxes (with a lid) then walk down to Wendy to collect the sack truck first. It's a long walk if you're carrying heavy bags. Wendy is sturdy, comfortable, historic and well-kitted out. We will definitely be returning in the future! Thank you. - Melanie J. 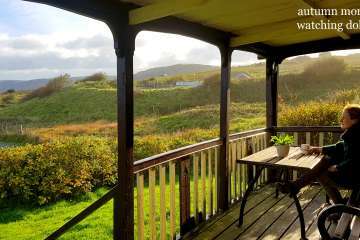 We had a fantastic time staying at Wendy - super location, beautiful views, and very cosy. Couldn't have been bettered! My partner loves the sea and this little gem is a simply stunning location for that. My partner and another couple made Wendy our Christmas treat, including a full Turkey Christmas dinner. We all had a wonderful time and left so relaxed our feet dragged all the way to the car. Can't wait to go back, it might be our annual Christmas treat. We had a wonderful time in Wendy. The weather was typical April showers and quite chilly but we were snug inside. The views were amazing and we visited lots of pretty beaches along the coast. We definitely recommend staying in Wendy any time of year. We really enjoyed our holiday on the Ceredigion Coast! 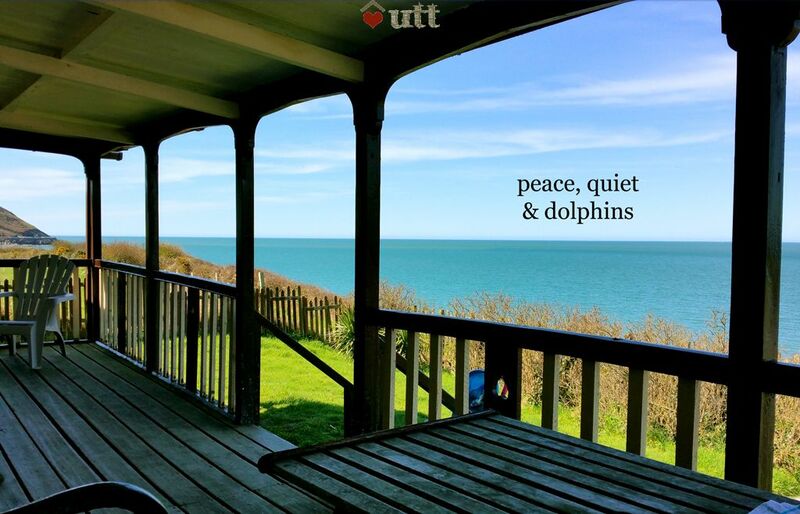 Wendy the Aberporth express is the perfect coastal getaway. The carriage is packed with character and had more than enough space for myself and two friends (one of whom was heavily pregnant!). It had everything we needed and more for a comfortable stay. I particularly enjoyed having my lunch sat on the bench outside whilst looking out over the ocean and listening to the waves - perfect! 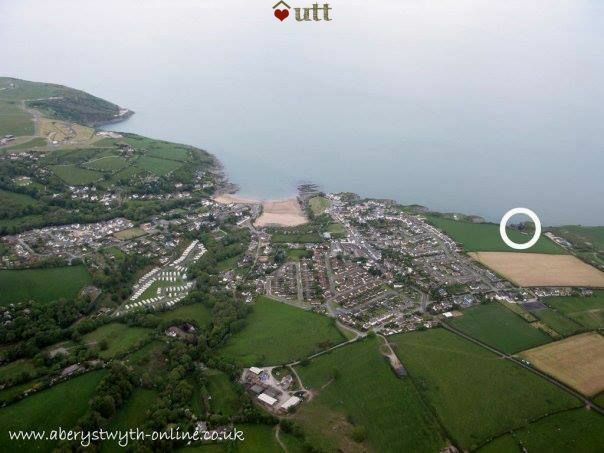 We explored Aberporth, Cardigan and Tresaith and their beautiful beaches. We also drove to Tenby for the day, which took just over an hour each way. 'The Ship' pub in Tresaith is a definite for Sunday lunch.